Calcium is often used as a screening test as part of a general medical examination. It is typically included in the comprehensive metabolic panel. Your doctor may order an ionized calcium test if you have numbness around the mouth and in the hands and feet and muscle spasms in the same areas, which are symptoms of low levels of ionized calcium. If calcium levels fall slowly, however, many people have no symptoms at all. A normal calcium result with other normal lab results means that you have no problems with calcium metabolism (use by the body). Because about half of the calcium in your blood is bound by albumin (a protein), these two tests are usually ordered together. Calcium values must be interpreted in combination with albumin to determine if the calcium concentration of serum is appropriate. As albumin levels rise, calcium rises as well, and vice versa. Hyperparathyroidism (increase in parathyroid gland function): This condition is usually caused by a benign (not cancerous) tumor on the parathyroid gland. This form of hypercalcemia is usually mild and can be present for many years before being noticed. 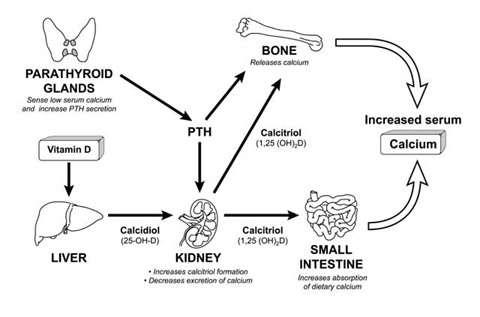 Cancer: Cancer can cause hypercalcemia when it spreads to the bones, which releases calcium into the blood, or when cancer causes a hormone similar to PTH to increase calcium levels. kidney transplant, and high protein levels (for example, if a tourniquet is used for too long while blood is collected). In this case, free or ionized calcium remains normal. High levels of ionized calcium occur with all the above, except high protein levels. Low calcium levels, called hypocalcemia, mean that you do not have enough calcium in your blood or that you don’t have enough protein in your blood. The most common cause of low total calcium is low protein levels, especially low albumin. When low protein is the problem, the ionized calcium level remains normal. Causes of low ionized calcium levels include all the above, except low protein levels.